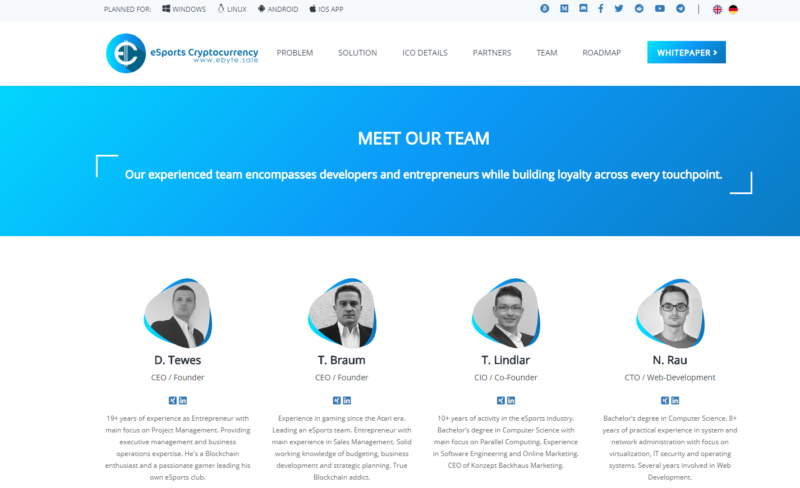 EByte is a new cryptocurrency in the market centered on the eSports industry. It will have its own blockchain instead of relying on the Ethereum network like those ERC20 tokens. At the moment, it’s still having its token sale (pre-ICO). Disclaimer: All opinions and views that are expressed here are purely individual opinions. None of the articles are to be construed as giving financial or investment advice of any sort whatsoever. We do not guarantee the accuracy of the information on this website, including cryptocurrency news and articles. According to them, eSports teams normally lack resources to equip players with the latest technology, making players switch teams really often just to get better opportunities. This makes it hard for teams to manage rosters and attract new sponsors for their teams. Most leagues, events and tournaments do not have enough financial means to promote their activities, thus making it hard to grow their projects. Sometimes eSports organizers do not get paid due to the lack of funding and they mainly do it for the passion. Finance seems to be the big problem in the eSports industry at the moment, and only dominated by the big leagues. 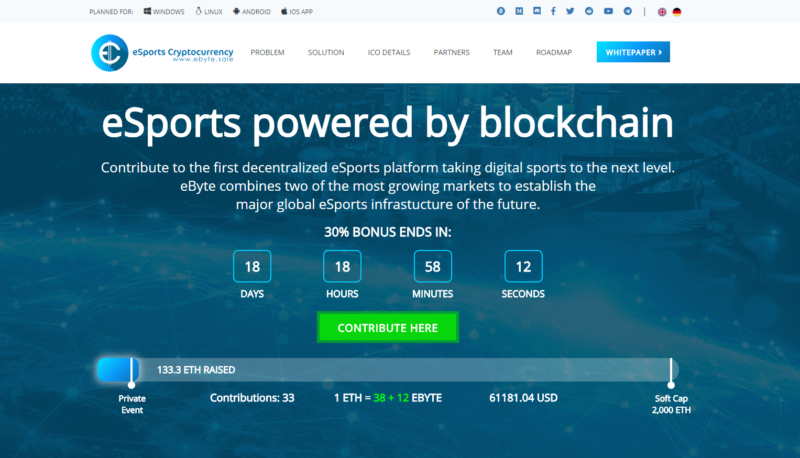 Due to some of the problems faced in the eSports community, eByte aims to provide solutions via blockchain technology. eByte will create a platform to provide investors and sponsors a good overview of the market, specifically on the teams, leagues and players. Develop smart contracts to create a market economy in eSports. You can then monetize eSports events or projects by a safe distribution of participation fees. It should also pay prize money to all participants and generate income via mining. The eByte blockchain will allow sponsors and fans to support their favorites via cryptocurrencies in a safe manner. eByte will have betting portals and the manufacturers of eSports content will be able to make profits from there. There are other solutions given in the whitepaper as well. The solutions given seem to be mainly monetary. It’s more and more common these days for cryptocurrency to be used to pay for many things including content creation. Just look at Steem, Mithril and so on. They all incentivize usage of the platforms. Quick transactions. It’s apparently faster than Bitcoin, Ethereum and many coins. Transactions should be able to be confirmed in less than a minute. Global payments. You can transfer eBytes from anywhere. Security. They use encryption and blockchain tech to secure coin transactions. eByte mining. Anyone can create a wallet and mine eByte. The team of eByte is made up of a lot of people that have been in the eSports industry. The screenshot taken is only on the higher ranks of the team. There are plenty others which you can find on their official site itself. Their ICO token event is divided into several stages as you can see on the screenshot above. At the moment, they are only doing the pre-ICO where at the moment, only 133 Ethereum has been raised so far. As EByte is really new, there isn’t much that we know so far, apart from what’s in the whitepaper and the official website. It’s not even at the ICO stage yet, but the presale. As always, do your own research before investing into any coin and don’t invest what you can’t afford to lose. Our articles are always not sponsored, unless expressly stated otherwise.